My tiny resin fairy tale. And finally, last of the #DollConDK haul: Things I won! I'm beyond thrilled with the @readyteddygo2u top, I've wanted one forever. The cute sticker is made by @ambientpink.shop, the funky little necklace by @mewiefish, and the Impldoll Dylan head was donated by a Danish collector. Please contact me if you'd like to exchange links! They’ll fit A-line feet, but will very likely be too big for Moe-line feet. Please keep this in mind when buying! Not refundable and fairly short term. I will ship the item 1-2 weeks after receiving payment. I will not underdeclare an item if asked. I will not mark an item as a gift if asked. I do not require insurance. Please keep in mind that if you do not choose insurance, I am not responsible for loss or damage in transit unless the item is misaddressed or poorly packaged. 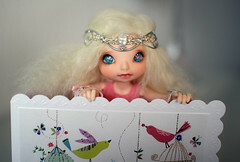 Lilanie lives in a non-smoking household, has pets, does not have own transportation to go to the post office, has an irregular shipping schedule, is currently selling other items, has feedback on eBay, has feedback on other doll forums too. Also, feel free to offer, if you feel the prices are too high! THIS IS FOR OBITSU LARGE CHEST. The sandals are for obitsu feet.